Many families hide eggs filled with candy for kids to find in celebration of Easter. This year, join others for the holiday tradition on the days leading up to Sunday, April 1. Below are community egg hunts happening in Philly, at museums, activity centers and parks. Most of them are free. Thirty-five thousand candy-filled eggs will be hidden at Gorgas Park in Roxborough on Saturday, March 31. Plus, there will be a petting zoo, face painting, balloon animals and photo ops with the Easter bunny. The day before Easter Sunday, Awbury Arboretum will host an egg hunt at 10 a.m. Kids should bring their own baskets to collect eggs and parents may want to bring a picnic to enjoy afterwards. Adventurewoods Natural Materials Playground in the arboretum will also be open. One Liberty Observation Deck will host its first egg hunt on Saturday, March 31. It will take place 57 floors up, overlooking Philly. Just don’t forget to bring a basket to collect the eggs. Kids and their families will get to meet the Easter Bunny, too. This year, Franklin Square is putting a new twist on its traditional Great Egg Hunt. Children age 10 and under will receive a map, "carrot cards" and an Easter egg box, which they will use to navigate Franklin Square in search of giant spring tulips. At each stop, kids will hand over their "carrot cards" to receive Easter eggs. Once children complete the trail, a surprise guest awaits at the last stop. Children can experience Swedish Easter traditions on Sunday, March 25, at the American Swedish Historical Museum. There will be crafts, face painting, dress-up games and an egg hunt. The event is free for museum members and children age 2 and under. Non-members must pay a $10 fee at the door. On Saturday, March 24, families can enjoy a free Easter egg hunt in East Passyunk. Egg hunt times will be staggered by age group. Children age 4 and under will start at 11 a.m., age 5 to 7 wil begin at noon and age 8 to 10 will hunt for eggs at 1 p.m. Inside the eggs, there will be candy and toys. Kids will decorate egg-collecting bags before starting their search and can pose for photos with the Easter Bunny, too. 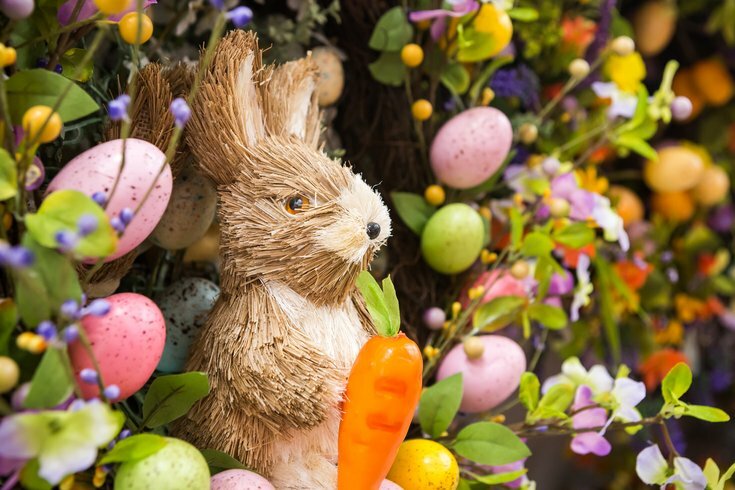 After the egg hunt, select restaurants along East Passyunk Avenue will offer kid-friendly brunch and shopping specials. Turn an Easter egg hunt into a full day of play at The Please Touch Museum. The event will take place Saturday, March 24 and is free with museum admission ($19). Remember to bring an Easter basket to collect eggs.